don't you find that it's often simple things that really make you smile? okay, so i'm totally getting off topic (it's those darn glass jars - they just do something to me.). so what i really wanted to share with you was the simple something that has made me so smiley in my work lately - labels! cute, huh? i think they turned out so great. the reverse even gives washing instructions! soooo official :) i've really loved using them. *and lastly in alacrity news (this is really the most random/long post! ), i'm still doing the gown/cap deal if you're interested! 2 sets for $25 each (see end of post below). thanks for the encouraging comments on my works, kelly! i'll take them. your tags are really cute and do look so official. i'm liking that pink elephant design, too. 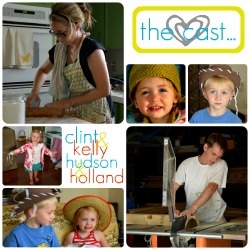 not to mention the pics of the hudster....a mini combo of the two of you, i think! thanks - i do love a pink elephant! i'm actually thinking of possibly creating second pink elephant design - they're just so darn cute! you think he's a good combo? so glad. his "stick-y up-y" hair is just like my baby pictures! You guys okay? Hang in there - we're praying that Ike isn't as bad as they're predicting!